At secondary level, the two ESF all-through schools, Renaissance College and Discovery College offer the International Baccalaureate Middle Years Programme (IB MYP) from Years 7 to 11. 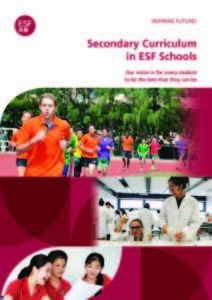 For the other five ESF secondary schools, the curriculum are aligned to the MYP framework from Years 7 to 9. At Years 10 and 11, students follow a school-designed curriculum with an approach that is broad and balanced leading to a suite of IGCSE and GCSE qualifications. Subjects include English, mathematics, science, the humanities, creative and performing arts, design technology and an additional language(s) at an appropriate level. At Years 12 and 13 (post-16), students have the options of taking the IB Diploma programme or the Applied Learning Pathway. At all levels, the curriculum is differentiated to cater for students’ learning needs. Students are supported to choose the most appropriate pathway for future education or career.